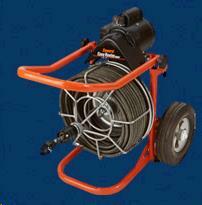 Capacity: 50 ft. of 9/16" Flexicore Wire Rope Center Cable. Motor:1/3 hp heavy duty, capacitor start, thermal overload protection, Forward/Off/Momentary Contact Reverse Switch. * Please call us with any questions you may hav about our snake sewer 50 foot elec rentals in Wayzata MN and the Western suburbs of Minneapolis.